Fresh flowers are known to cost a bomb in Singapore, especially during occasions like Valentine’s Day and Mother’s Day. But with these cheap flower delivery services, you don’t have to wait for special occasions to surprise your loved ones. Inspired by this thoughtful gesture, I compiled this list of affordable florists that provide cheap flower deliveries in Singapore. All 11 florists listed offer standard bouquets for $50 and below. Cheapest bouquet: The Enchanted Tree has the most affordable bouquets – just $30 for their Daily Pick, with free delivery! But you can’t select your bouquet design or the flowers in them as there’s just one design per day. Mini bouquets: If you’re not trying to impress but just want to send a thoughtful little gift, mini bouquets (from $22) are a nice way to do it, and they’re cheaper than regular bouquets. They’re available from Petite Fleur and First Sight SG. Free delivery: Another way to save on costs is to find a florist with free delivery, as paid delivery can cost upwards of $10. 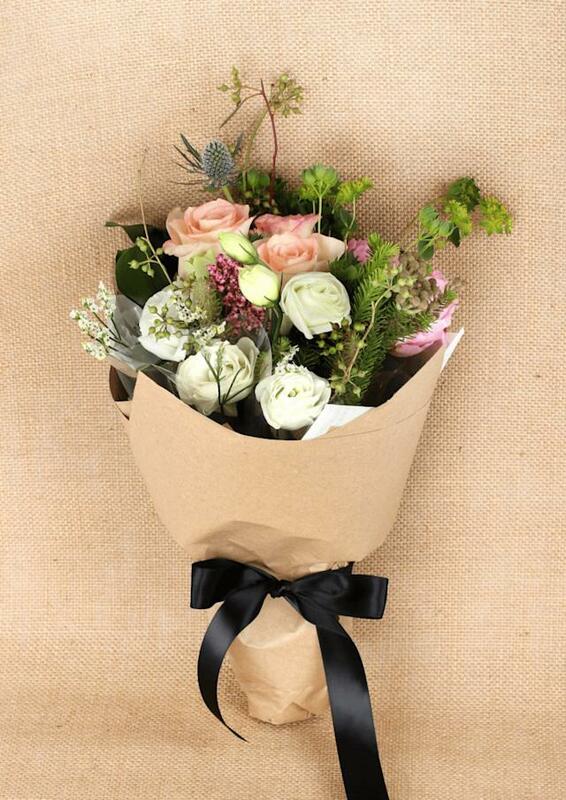 The Bloom Box, Happy Bunch and Windflower Florist all offer free delivery in Singapore. The Enchanted Tree is the most affordable option for cheap flower delivery in Singapore – they only offer one bouquet (the Daily Pick) and it goes for $30 including delivery. The flowers and arrangements change every day and typically include popular flowers like roses, hydrangea and sunflowers. If you want a bigger bouquet, you can get the Double Pick ($60) which is essentially 2 bouquets combined into 1. Green Acres is a full florist service, selling not just bouquets but flower stands, wreaths and gift baskets too. For $30, you can get the simple Humble Gesture bouquet (carnations and baby’s breath flowers). Although it is the cheapest option, I actually prefer the the palm leaf and clear plastic wrapping to the colourful crepe papers used for the more elaborate bouquets that cost $40 and up. 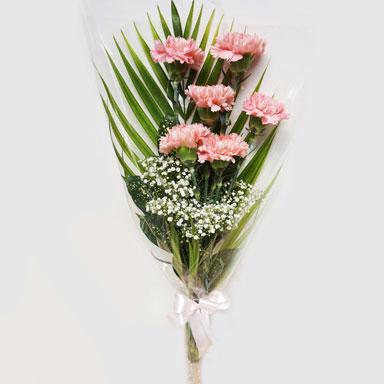 Our Office Superstar bouquet by Far East Flora ($31.99). Far East Flora is a household name – I can’t even count have many times I’ve driven past its huge signboard along Thomson Road. I expected their prices to be steep (the nursery is huge!) but it’s actually quite affordable. A basic bouquet costs $29.90 ($31.99 after taxes). With the smaller accompanying flowers, the bouquet looks presentable, but do note that these bouquets typically only include 1 or 2 stalks of the main bloom (e.g. the Our Office Superstar bouquet pictured above only has 1 sunflower). Like Green Acres, Far East Flora has an impressive range of flower products for different occasions. An example of a past Freestyle Bouquet made by Floral Garage ($34.90 to $42.90). If you like a bit of spontaneous fun – isn’t that what surprises are about anyway? – try the Freestyle Bouquet by Floral Garage ($34.90 to $42.90). You don’t get to choose the exact flowers and arrangements, but instead, you fill up a form so the florists can customise a bespoke bouquet for you recipient! You can choose from traditional, modern and rustic styles, and indicate what colours to avoid. You can also fill in the recipient’s age and what occasion the flowers are for. The Bloom Box is my favourite of the lot (I’ve literally been tagging my fiancé in their Instagram posts) because the “bouquet” is actually a chic carry-around box. It costs just $35, looks good on your office table or bedroom dresser, and is easy to bring home – I imagine carrying a bouquet of flowers would attract some stares in the train. A double size is available at $60 too. Happy Bunch is priced the same as The Bloom Box, at $35 including islandwide delivery. And if you order before 12.30pm, you can even have it delivered on the same day before 6pm. Happy Bunch also goes on a daily arrangement basis, so you can’t choose your flowers. I wouldn’t worry though – their flowers look good every day (just check out the Happy Bunch Instagram). I especially like that their bouquets are wrapped in a nice woven fabric. For larger and more impressive bouquets, you can combine 2 of them (double bunch, $65) to as many as 5 (quintuple bunch, $165). So most of Floral Passion‘s bouquets are over $50, but you can still get some pretty blooms from $12! A small bouquet of gerbera daisies cost $12, while a standard bouquet of hydrangeas are $35. 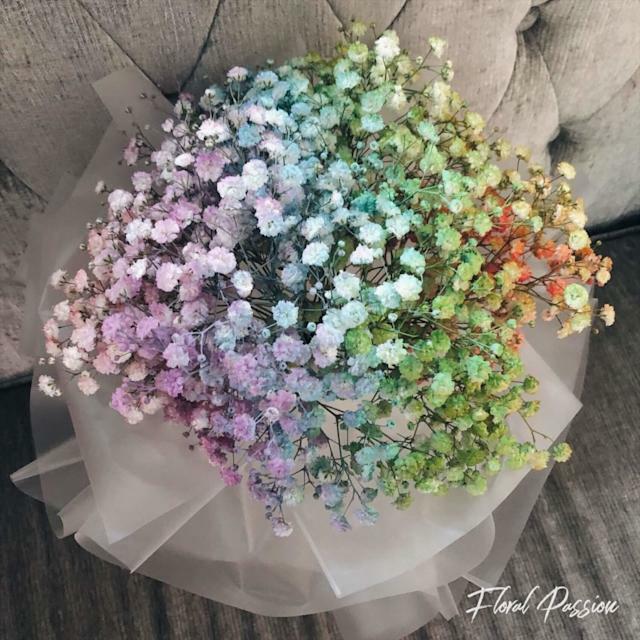 There’s also the Instagram-able bouquet of rainbow baby’s breath flowers ($40). You can also write in for flower subscriptions (weekly, fortnightly or monthly). First Sight SG is the place for fancy flowers – their blooms are imported from Africa, Taiwan, Holland and more. They’re most known for their everlasting range of preserved flowers, which you can also get from $38. If you’re on an even tighter budget, order the whimsical Bundle of Joy which is a mini bouquet of rainbow-coloured baby’s breath flowers ($24 for 2). Petite Fleur is another florist that sells mini bouquets – theirs start at $22 (Baby’s Breath Cotton Candies bouquet). 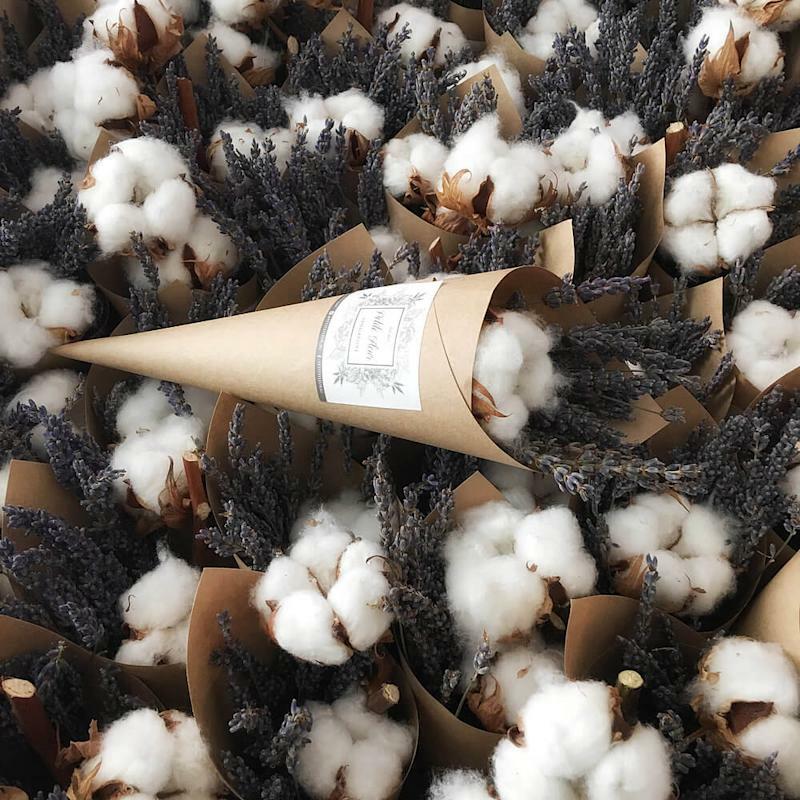 For a surprise that will literally last forever, get the Cotton and Lavender micro bouquet ($25). The fluffy cotton blooms hail all the way from Israel. Windflower Florist‘s most affordable bunch is the 6-rose A Study bouquet. Interestingly, the same bouquet comes in 7 colours, with the roses dyed to your colour of preference. The cute Cotton Fluff bouquet of cotton, lavender, dried wheat, dried caspia and baby’s breath is also $43. You can also consider these two popular local florists: Hazel Florist & Gifts and Noel Gifts. However their cheapest fresh flower bouquets cost $50 before taxes ($53.50), which technically puts them out of this list. Since Valentine’s Day is coming, here’s a price list of the above florists’ and their special-edition bouquets. Florist Valentine’s Day bouquet prices Any promotions? Floral Garage $38.25 to $159.80 15% off orders made before 31 Jan 2019. 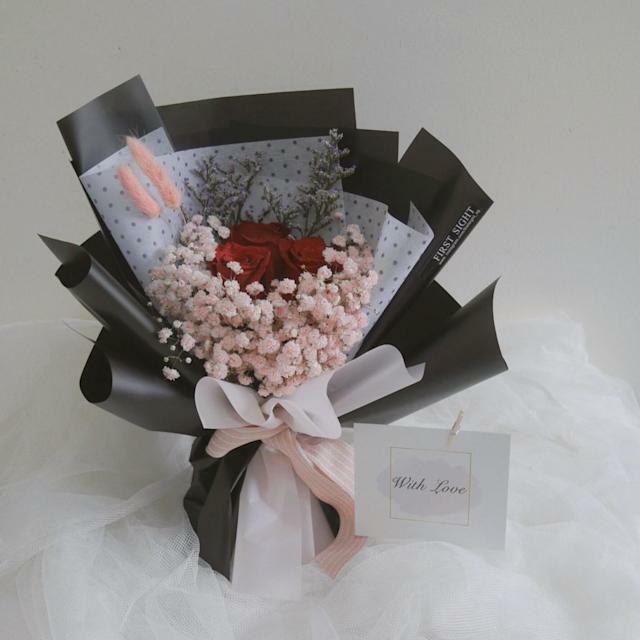 Windflower Florist $39.90 to $128 10% off for orders delivered between 11 to 15 Feb 2019. Far East Flora $85.49 to $5,349.89 Up to $100 off. Prices already discounted on site. The Bloom Box $99 Flower box comes with Amo Ferragamo Eau De Parfum (30ml) OR an Awfully Chocolate bar. The Enchanted Tree $120 to $150 20% off for orders delivered between 11 and 13 Feb 2019. 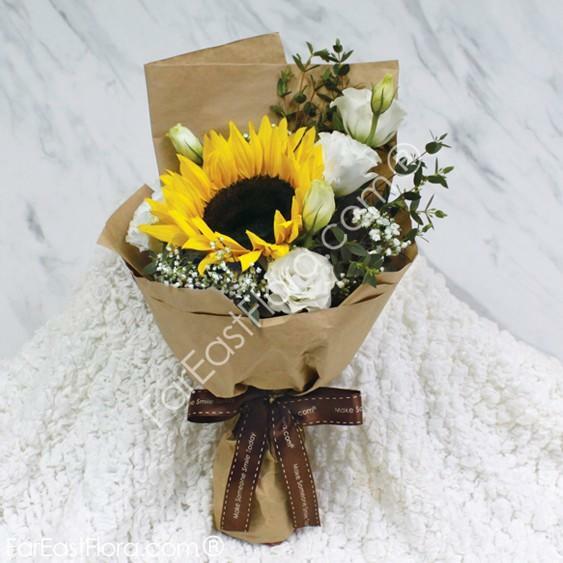 Do you have other affordable florists to recommend for cheap flower delivery in Singapore? Share them with us in the comments below! In-article images by The Enchanted Tree, Green Acres, Far East Flora, Floral Garage, The Bloom Box, Happy Bunch, Floral Passion, First Sight, Petite Fleur and Windflower Florist. The post Cheap Flower Delivery in Singapore - 10 Best Florists for Bouquets Under $50 appeared first on the MoneySmart blog.